Holy (Alpha and) Omega Beams, Batman! The final installment of our five-part series on the moral and philosophical underpinnings of Superman: The Animated Series, written by our resident animation expert Jeremiah Lawson aka Wenatchee the Hatchet, is here! We hope you’ve enjoyed it as much as we have. This series is dedicated to the memory of Dwayne McDuffie. 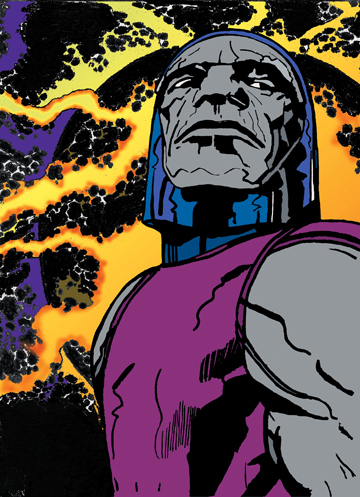 While Jack Kirby’s New Gods were not originally created with any connection to Superman, over time Kirby’s evil god Darkseid became a recurring foil for the Man of Steel. Ruling from the wasteland planet of Apokolips, Darkseid seeks to remold the universe to his will and feeds on the fear and despair of others. A physical match for Superman and possessing “Omega beams” that allow him to look at someone and kill them, Darkseid is considered by many Superman fans to be the hero’s most powerful and evil nemesis. For those who see Superman as having god-like powers, only be a fellow god could prove an even match. [Superman: The Animated Series producers] Paul Dini and Bruce Timm made overtures toward introducing Darkseid early in the series but did not bring him front and center in the story of Superman until the third season. Warner Brothers had approved a full third season but not a fourth season, forcing Dini and Timm to streamline most of the stories they wanted to tell using Darkseid and Jack Kirby’s other “Fourth World” characters. As Dini and others noted in their commentary on the series, they responded to the studio’s decision by cramming all of their story goals into the final season, which led to the series ending on an unusual and grim note. The season opens with the cleverly-titled episode “Apokolips Now,” with Darkseid leading an advance army using weapons even Superman could scarcely endure or repel. Darkseid, like Luthor and Brainiac before him, offers Superman the opportunity to rule with him as a lieutenant. Superman refuses but is warned by Darkseid, “If you will not be my knight, you will be my pawn.” The god of Apokolips proceeds to batter Superman physically and presents him, defeated, to Metropolis as a warning to all of them to give up hope of victory and submit to Darkseid as their new master. The people of Metropolis refuse and one Metropolis cop, Dan Turpin, finds a way to free Superman. In the nick of time, Darkseid’s enemies from New Genesis, the sister planet of Apokolips, arrive and order Darkseid to leave. The Man of Steel is quite literally saved by divine intervention. As Superman revels in this vicarious victory, Darkseid departs – but not before killing Dan Turpin with his Omega beams. Overcome with rage and grief, Superman destroys the bonds that once restrained him. Superman has great powers but he is no match for death. Death is, after all, the fate of every man, and the living take it to heart. Whereas Luthor and Brainiac challenge Superman, Darkseid is able to both defeat and humiliate him. In an ostensibly children’s TV show it can be hard to overstate the significance of Superman finally meeting an adversary like Darkseid. More than either Luthor or Brainiac, as Dini has put it, Superman has unreserved hatred for Darkseid. This hatred is not solely a matter of Darkseid’s ruthlessness. No, by the end of the series, Darkseid and his servants lure Superman into a trap, torture and brainwash him, conditioning into believing that he was raised by Darkseid on Apokolips. With this reprogrammed history in his head, Superman is persuaded by Darkseid to go conquer worlds on his behalf. Naturally, he is dispatched to Earth first. Whereas Luthor and Brainiac unsuccessfully tempted Superman to sacrifice or rule the world for them, Darkseid makes good on his promise that Superman will be his pawn. Superman willingly goes to conquer Earth under his own banner. Long-time allies become enemies, and even though Superman eventually comes to his senses (and his sense of self), he is forced to realize that his legacy now includes having terrorized the world and people he swore to protect. In a bitter irony, only the vigilance of Lex Luthor leaves humanity with the tools to stop Superman from conquering Earth. Even of Superman it must ultimately be said that though the spirit is willing, the flesh is weak. After years of fighting for truth, justice, and the American way, Superman’s own legacy is tainted by lies, injustice, and an attempt at conquest. After Superman returns to himself, he heads to Apokolips to confront Darkseid. The Man of Steel has finally met someone he hates so much that he’s willing to kill. 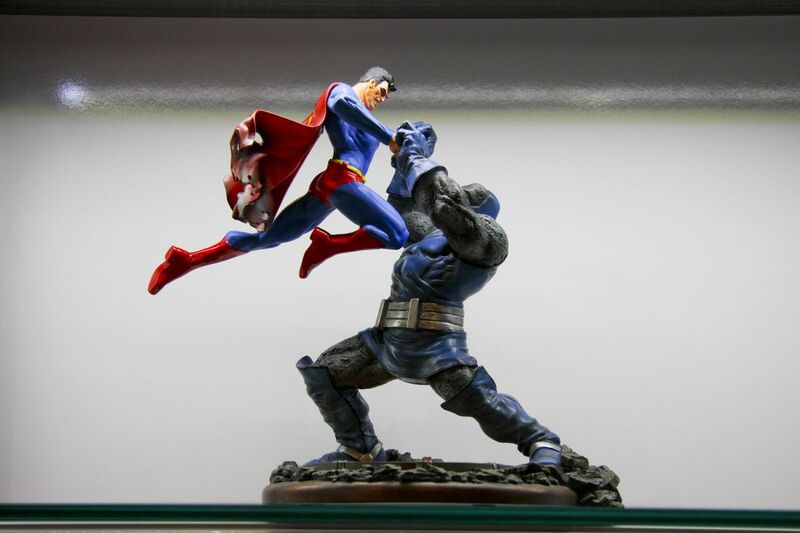 Darkseid is confident of victory but his pride leads to a fall. Superman covers Darkseid’s eyes so that the Omega beam Darkseid intended for Superman breaks the god’s own face open. The devil, as it were, is foiled by the success of his own devices. But Superman’s victory is a pyrrhic one. Most people of Earth now no longer trust him, and even after he has beaten Darkseid, he discovers that the god is still venerated by the people of Apokolips. As Dini put it in his commentary on “Legacy, part 2”, the series ended on a very dark note by showing that there are some evils that not even Superman can do anything to end. The final two-part story “Legacy” reveals that not only could Superman not manage to stop Darkseid, but he became the pawn Darkseid promised him he would be for refusing to be a knight. Stay tuned: More DCAU coming soon!